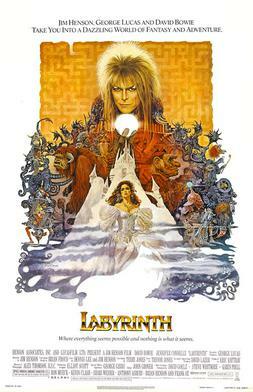 Ever since I was a child and I saw the trailer for this 1986 film I have always wanted to see Labyrinth. Of course in those days I was too poor to go to the movies much so I never got to see it in theatres. I did buy the Scholastic books on it and would stare at the drawings and wished to escape to that wondrous land someday. As time went on, my need to see this movie has dissipated. Then I noticed one day that this movie was available for instant streaming and the little kid in me jumped with glee. I immediately added it to my Netflix queue and promised to see it someday soon. Well the time has come and gone and I finally got to see it and escape into this Jim Henson created world. It has definitely lived up to my expectations. I just watched in awe and couldn’t imagine the work that went into creating that world before CGI became the prominent set design of our modern movies. It was extraordinary. The story itself was definitely for young adults and up and I didn’t mind how it ended all tidy and wrapped up as most family movies do. Changed My Netflix Subscription, Buh-Bye DVDs! I’ve always been a big fan of Netflix since I first found out of its existence. The convenience of holding on to a DVD for as long as I could without fear of late fees, being able to mail the DVDs with a self-stamped envelope and waiting for the next DVD to be delivered to my mailbox was very appealing. However, it has been this convenience that has also made me pay 2 and three times more than I would have with a conventional rental service for the same DVD. Not that I’m really complaining. I have no one else to blame but myself for holding on to a DVD for so long that I have to wipe off a layer of dust from the envelope before mailing it back to Netflix. The inception of instant streaming has only compounded my inability to watch a DVD within a week of receiving it in the mail. It’s just so much more convenient for me to watch videos on my TV through my Roku and/or TiVo set-top box. Also the fact, that I’m more inclined to watching TV shows than movies and you can see why DVDs will continue to collect dust on my shelf while I sit back and catch up on shows missed (Weeds), shows remembered (Cheers, Scrubs) and shows that I’ve been looking forward to see (The League). Netflix streaming is so convenient and fun that I’ve even fallen behind on my regular TV programming that’s recorded on my TiVo, or in my Hulu queue. Heck, I even watch shows on instant streaming that I already own on DVD (Farscape, Firefly). This of course isn’t too surprising as I’m not alone in being a Netflix enthusiast. A recent study showed that Netflix accounted for 30% of all internet traffic in North America whereas, regular web browsing dropped to 17%. It’s quite a phenomenon. With all this and after 2 years of instant streaming (give or take a year or more), I’ve come to one conclusion. I don’t care for DVDs anymore. They only collect dust in my possession. So this morning, I logged into my Netflix account and set up the instant streaming-only plan. I’m mailing them back “Monty Python and the Holy Grail” (which was collecting dust on my shelf for at least 6 weeks), and starting a new chapter in my media viewing life. It’s a new era in media consuming and at the moment Netflix is definitely at the forefront of it! Going To Be Writing for an Ezine! As you can see it’s a fun project and looks to be a fun time for all to enjoy. The first issue should be out within the next few weeks or so and hopefully it’ll be monthly on the 30th of every month thereafter. To sign up , simply email: NoFeZineList@gmail.com and use “Subscribe” as your subject heading. That should be it. To learn more about NoF check out their blog or main members page.